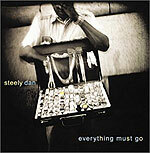 CD review: "Everything Must Go"
A new Steely Dan release has always been an event  it's just that the nature of the event has changed. During the band's heyday in the 1970s, they issued an album every year  from 1972's "Can't Buy a Thrill" through 1977's best-selling "Aja." A new Steely Dan release was an annual event  predictable yet appreciated, like the first signs of spring. From "Katy Lied" to "Royal Scam," you knew a new Steely Dan album was on its way, and you looked forward to it like your next date. But it couldn't last, of course. The three-year delay between "Aja" and "Gaucho" was only a preview  they wouldn't record another studio album until 2000, when "Two Against Nature" caught the music world by surprise. Which is simply another kind of event. And it's once again a surprise that "Everything Must Go" is out a Gaucho-like three years after "Two Against Nature." What's also a surprise is that Donald Fagen and Walter Becker have lost none of their ability to craft lovely little melodies, or couple them to cryptic, poetic lyrics. They retain, too, a knack for creating songs that are impossible to classify  and not because they're too weird or out-there, but rather because they are so utterly familiar from drawing on so many styles and schools. It's not like either of them was in exile during their two-decade hiatus. Both remained active in the music business. But the fact that they could spend so much time away from writing and recording together, and then come back with an album like "Two Against Nature" that measured up against their very best, exceeded it in many ways, was a surprise. It's not unheard of, mind you. Steve Winwood and John Fogerty both made celebrated returns to recording in the mid-'80s. And then promptly faded away again. Bruce Springsteen has recorded in fits and starts, but little of his latest output is equal to his glory days. Of all the popular rock bands of the 1970s still creating new music, only Yes and Jeff Beck have maintained the caliber of creation consistently. But neither Beck nor Yes has the kind of popularity anymore that gets them aisle-end product placement, or cardboard cutouts at the store entrance. A week before "Everything Must Go" was released on June 10, the local Barnes & Noble had a giant cardboard sign promising they'd have it in stock. It's called a buzz, and Steely Dan still has it. So here we are in 2003, thirty-on years since "Can't Buy a Thrill," and the new album from Steely Dan is perhaps their best yet. It has all the radio-friendly melodic hooks of "Aja" and "Two Against Nature," the jazz-based grooves of every album they've done, plus a stronger sense of balance than they've had before. Aging with grace perhaps. The point we're trying to get at here is that nobody else has ever so seamlessly melded R&B and jazz and rock. The first track on the new album, "The Last Mall," is a prototypical Steely Dan song: there are sharp, incisive guitar leads; jazzy horn charts; a slowly undulating R&B backbeat. And of course, there remains Fagen's distinctive singing  the high, slightly urgent voice that projects both mystery and sophistication, cynicism and utopia. Now in their mid-50s, Fagen and Becker are still on top of the game, still turning out music that other musicians want to check out and selling so many copies that it forces the rest of the industry to pay attention. Here's looking forward to the next Steely Dan event.